Does your board buy-in to digital? Do they acknowledge the gaps and the commercial business case for investment? Are you an internal advocate of digital but feel like you need external support to sell into the board? 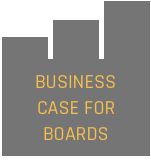 Are you on a board and require a stronger case for digital to move forward? We can build the commercial case for investment in digital and present to boards, business leaders and investors to get things moving.